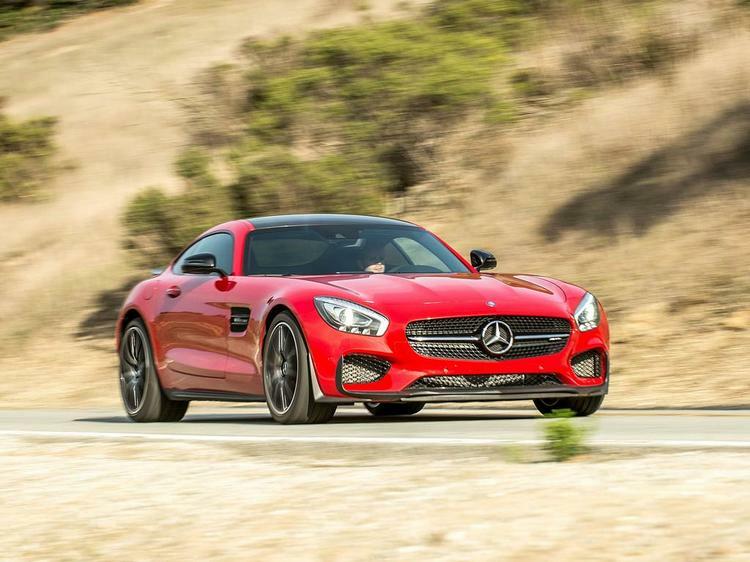 There are some big questions looming over the Mercedes-AMG GT, some philosophical like what it indicates about the future direction of a much-loved performance brand and fast cars in general. And others more straightforward, like does it sound good and does it do big skids. 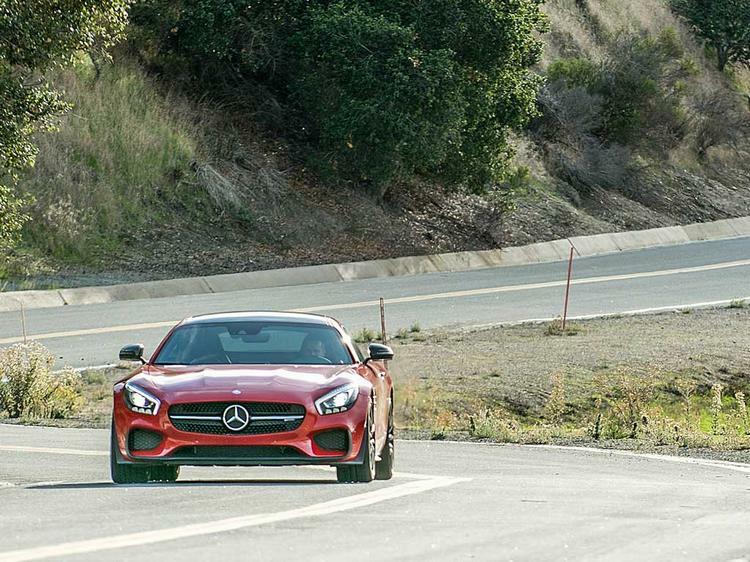 Throw both at senior AMG personnel like boss Tobias Moers and they roll their eyes at the former. And grin and nod at the latter. Which is kind of reassuring. Those worries though. Noise is a big one - can the 'hot-V' turbo 4.0-litre V8 that'll be at the heart of the AMG (and Aston Martin) range for many years to come match the old normally aspirated 6.2 for charisma and firepower? And can that straight-talking simplicity we've loved in AMGs of the past survive into the new high-tech era? No worries on the sound front; phew! Yes, it sounds fabulous. When you ask Moers his favoured settings in the Individual mode of the configurable driver settings he instantly fires back "Exhaust on loud!" before having to spend a bit more time mulling over the various permutations of settings for suspension, engine, ESP and more. No engine noise through the speakers here either. Just a solid, bassy rumble most definitely resonating through the exhaust system and unequivocally created by a very potent V8 engine. More so when you press the optional 'loud' button. There's absolutely no sense of forced induction in the noise or, indeed, the power delivery. Which is clearly a deliberate move. 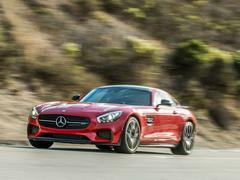 Where a 911 Turbo or GT-R make the rush of boost a defining character trait AMG clearly wants you to think the GT generates its 510hp and 480lb ft without the help of a couple of turbos. And does a pretty convincing job. Moers explains that the engine has been deliberately mapped so as not to deliver the great big wallop of low down torque that characterises so many modern turbo engines. This despite the figures saying peak is available from just 1,750rpm on the higher powered S model we drove. Yes, it feels immensely gutsy and strong. But the engineers wanted to avoid sudden destabilising spikes of torque for a more predictable, linear throttle and improved corner exit traction. It bloody works too. 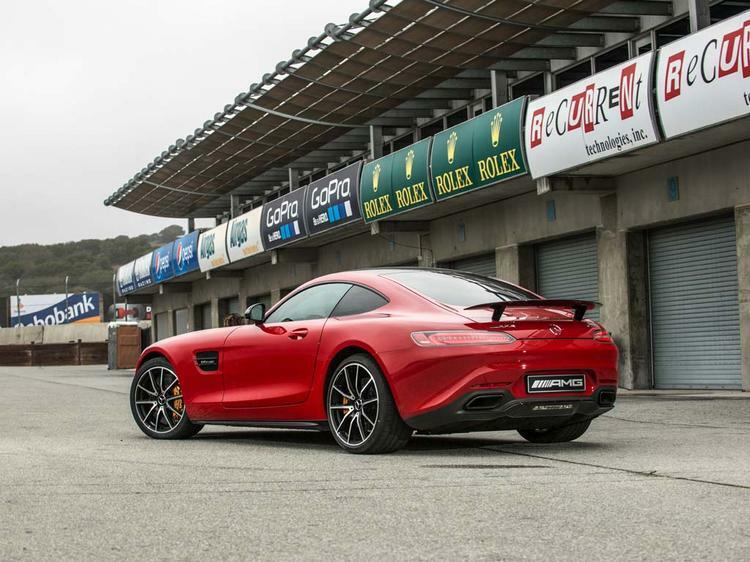 The first time we drive the GT in anger is attempting to keep up with Bernd Schneider at Laguna Seca, whose definition of a ducks and drakes 'warm-up lap' is best described as uncompromising. Bernd's immediately on it and the only option to try and find the line is to keep up with him. 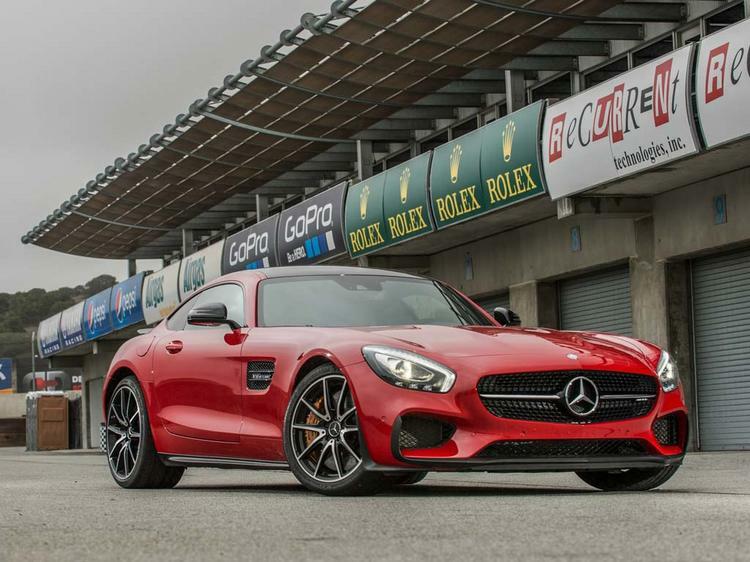 A little squiggle on a freeway entry ramp earlier suggested the GT has a traditionally AMG approach to laying down its power but on circuit it's clear there's more sophistication than ever before. Our S models have the electronic locking diff and with a little slip dialled in to the mid-way ESP Sport setting you can feel it playing with the power to maximise traction. Indeed, it quickly becomes clear skidfoolery requires serious provocation. Mainly it wants to go forwards. Very rapidly. 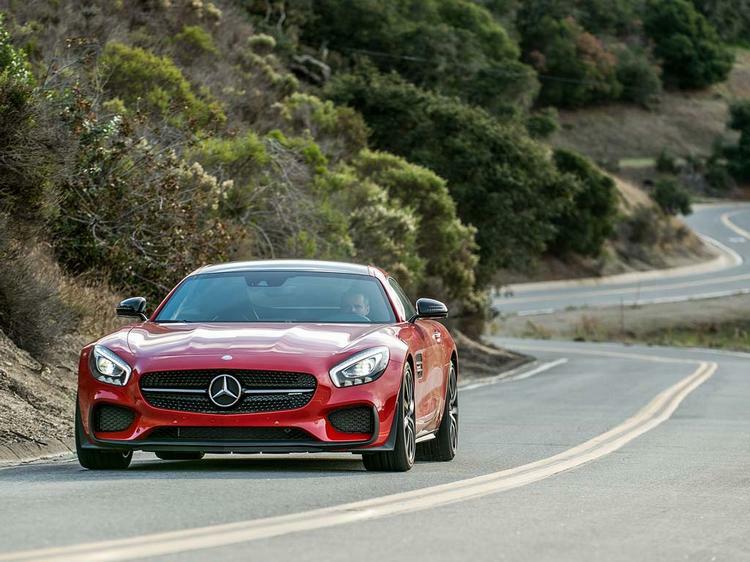 It's still a car whose cornering attitude can be very easily dictated by throttle inputs. But as the realisation dawns about how effectively the diff lays down the power you goad yourself into earlier and bolder applications of power. And, dammit, the thing just grips and goes. And goes. And ... blimey ... REALLY goes. With peak torque available all the way to 5,000rpm and peak horsepower at 6,250rpm you've got a huge powerband to play in and the reach of third and fourth gears in particular is enormous. It will pull from short-shifted higher gears but you need revs to get the most out of it and it's still pulling really hard at the 7K limiter. So the engine's good. What about the steering? Here it's harder to be objective. First things first, it's still hydraulically assisted and the variable ratio rack is thankfully not a fully active system like the one in the Huracan. Thank god. It's a more straightforward mechanically progressive rack that, around the dead centre, is geared the same as the SLS's before speeding up at the extremes. Given that AMG deliberately ditched such sytems when turning cars like the A-Class into the A45 and insisted on a linear rack, is this not a betrayal of a core value? It's definitely not as weighty or decisive as what we'd now class old-school AMGs like the SLS or outgoing W204 C63. Without that resistance to work against it feels quite darty and light on first encounter. 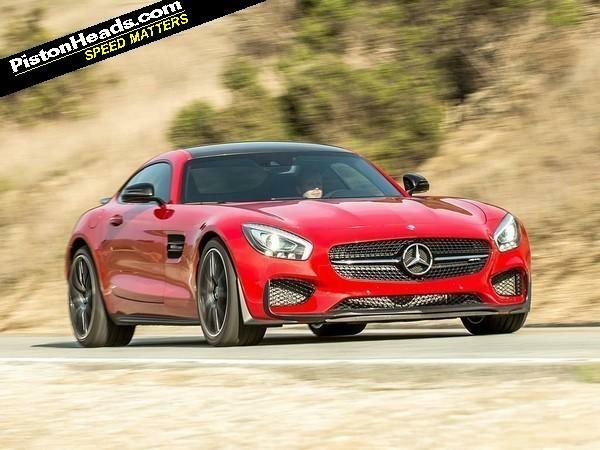 Forget all the turbos and other distractions - this is the first time the GT feels like something different. And, as such, it's hard to reconcile this lack of weight and feel with the clearly huge reserves of front-end grip. If not as light as a 911 the GT is a significant chunk less than an F-Type or V8 Vantage and its mass is well contained between the axles. This, significantly improved stability under braking and the diff's ability to open when you're off the throttle means turn-in is precise, predictable and exploitable. Once you learn to trust it. You need to have really, really got your approach speed to a corner wrong to have it feel like it's going to push on and stabilising effect of the rear axle when you get back on the power means it turns neatly and with surprising agility. 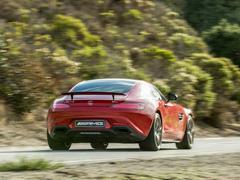 The F-Type R that seems the most natural rival in terms of power and purpose wouldn't see which way the GT went. It's way more sophisticated in the way it dissects a corner and that more nuanced power delivery is much more effective. 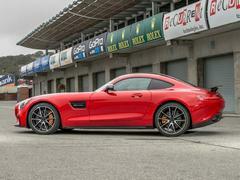 And where the Jag will be bonfiring its tyres and demanding more than a dab of oppo the GT carries huge speed into the corners and exits them with just a nadge of corrective lock. 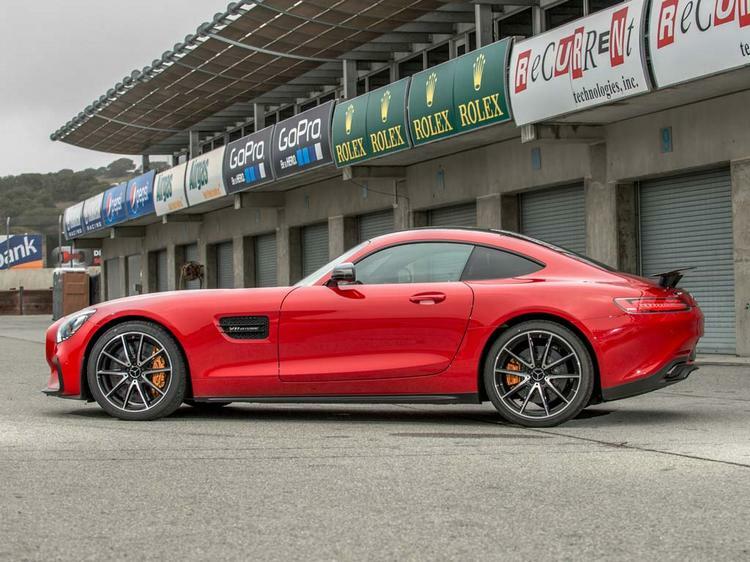 The gearbox is an evolution of the Getrag seven-speed double-clutch used in the SLS (and, indeed, Ferrari 458) but the calibration and response is night and day better. Drive an SLS in manual mode and one tug in four of the downshift paddle on corner approach typically gets a refusal. 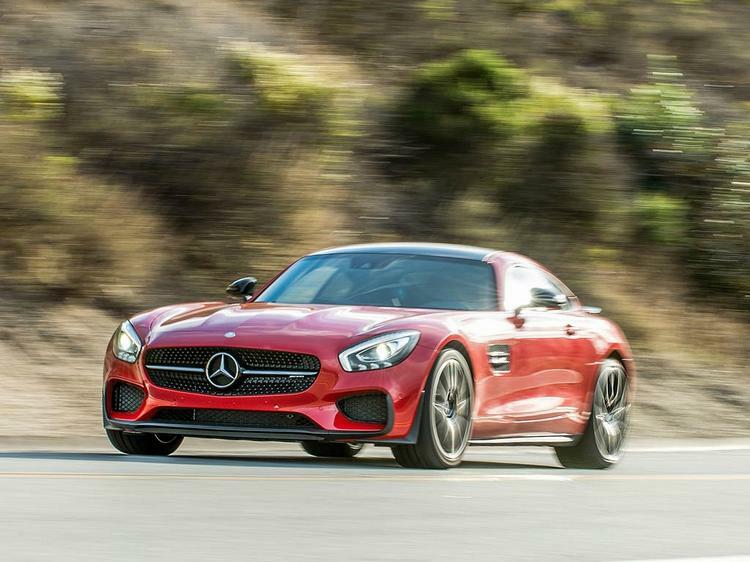 Not so in the GT - shifts are delivered rapidly and exactly when demanded. Indeed, at anything other than maximum attack it's almost too keen, often delivering two or even three downshifts when one would have done. 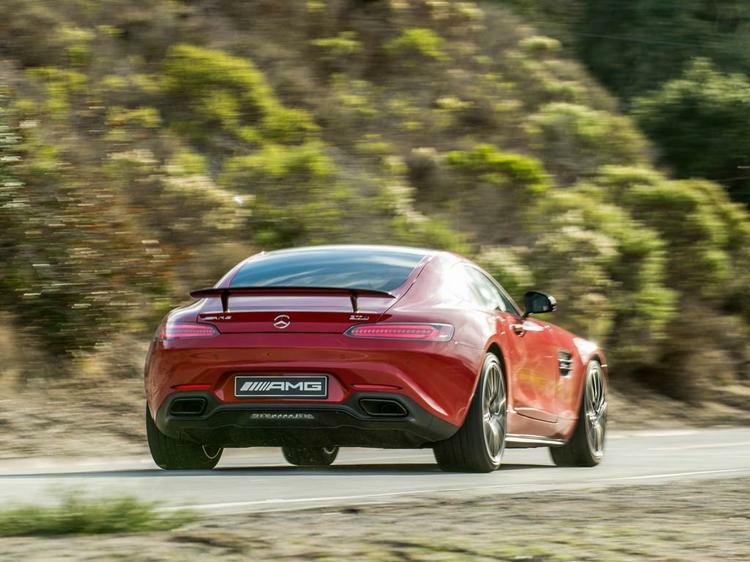 As with other AMGs, the automatic S+ mode is, whisper it, often the better option and very canny at delivering the shift just when you want it, complete with an extravagantly executed blip. What's so impressive in the GT is the way all the technology interacts with seemingly a common goal. Much like the BMW M3/M4 you get the impression of some very thorough and extremely clever calibration work, most keenly expressed in the wide operating window of grip and slip available in ESP Sport mode. If you're clumsy it'll intervene with equal heavy handedness but keep it smooth and you discover it's willing to work with you and let you play with the GT's cornering attitude through trailed brakes and increasingly bold throttle inputs. And then you can slip it back into Comfort mode and chuckle at the little icon of a sailing boat that comes up as the GT literally freewheels back down the freeway to home. Here you can appreciate the more luxurious flourishes making good on the name, the low-slung driving position snuggled between doors and a substantial transmission tunnel festooned with those mode buttons. The slot-like windscreen, burly low-speed ride and width of the thing make it a reasonably intimidating device in traffic. 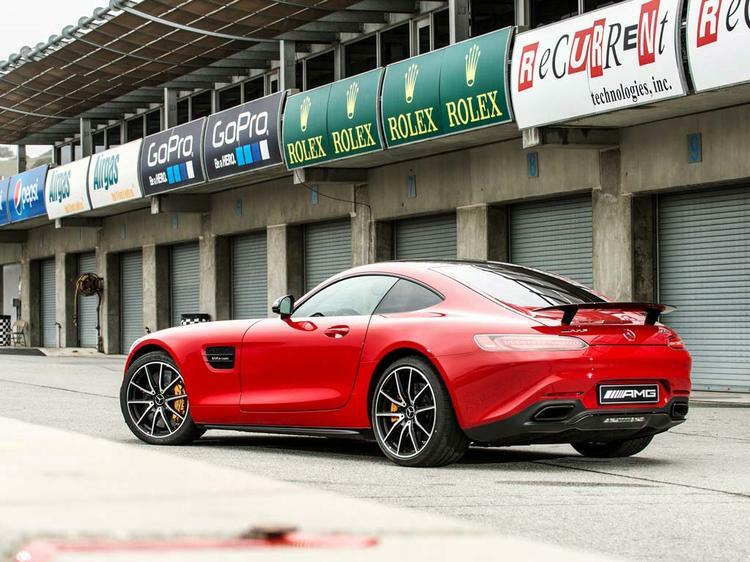 And though shorter than an SLS it's no narrower, meaning it doesn't really feel much more compact in real terms. The presence of the SL in the range means cruisers remain catered for, leaving the GT able to play more to the bruiser and open up an exciting new front in an increasingly competitive area of the market. It's got some formidable competition, with more on the way too. 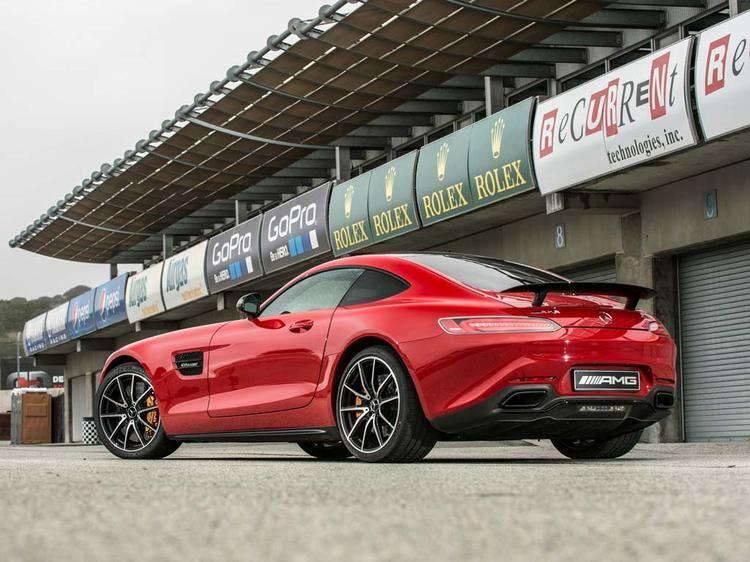 But as a way of introducing a new engine, a new way of thinking and a very new-school interpretation of AMG's core values the GT is off to a flying start. Want more stats and tech? Read our preview story here! 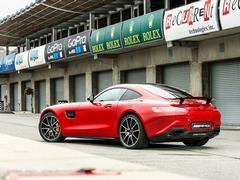 I love the video, that's what Mercs do so well, cruise, do you still want that 911, yes! because I don't want a auto sports car, it takes my fun and interaction away. I am sure it good but for me its just a little ugly. That engine in a Aston Martin though Hmmm. This is solid proof car manufacturers can still produce a great sounding motor without the need to pipe induction or exhaust noise into the cabin. Im really looking forward to the new C63 now the AMG GT has been released. Not sure about the looks side on - it looks like a 911 that has its nose pulled. So much want. I'll take mine in yellow please!